Stainless Steel Threaded Stud Housing Allows for Installation Into Any Available #8-32 Threaded Hole. Available with Resistances of 2252 Ohms, 3000 Ohms, 5000 Ohms, 10,000 Ohms or 30,000 Ohms at 25°C. Available with 12" (305mm) Long PFA Insulated Wires or 40" (1meter) Long PFA Insulated Cables. The threaded housing on this sensor allows for installation anywhere where a #8-32 hole is available. 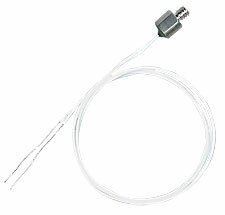 Its small size requires a minimum amount of space allowing installation into applications where other sensors can't go. 참고: For additional cable length add required length (in inches) to the end of the Model Number and add $0.80/ft to the price. For a phone plug connector, add "-PP" to the Model Number and $7 to the price.